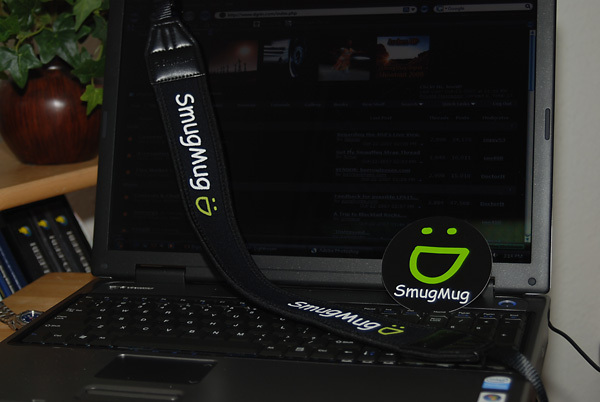 Hey Awais, just send email to straps at smugmug dot com with your address. How we ship to Pakistan, I dunno, but I guess we'll figure it out! We shipped quite a few international straps on Friday. Lots of exotic addresses. We had 5,000 straps made, received them on Thursday, and are almost out. We're gonna order 10,000 more, but it could take a month to get them. WeHey Awais, just send email to straps at smugmug dot com with your address. You guys are doing an amazing job sending these out for free! I have about 180 international orders sitting in the back of my car right now. I'm waiting for the post office to open and then they will go out. Yours is among them. Still waiting on mine! Anywhere we can go to check and see if ours has shipped yet? Can't wait!! It's like Christmas in October! Your strap shipped out on Friday. Your item arrived at the EVERETT, WA processing facility at 00:35:00 on October 22, 2007. Wow! Thanks for the update and I can't wait to get it! I sent an email last week... I'm not sure if I made the cut. Anyhow, it's very cool that you guys are doing this. Smugmug 4 Life. I sent a PM (as that was the instruction). Did it get in? You did, but it hasn't shipped yet. Your item arrived at JENKS post office, 74037 at 08:13:00 on October 22, 2007. What's this about sending a PM? I sent an email... Should I have received a reply? I wanna be smug too! Hmmmm...I sent an e-mail, not a PM...should I send a PM? its even a very good quality strap.... I am some one that perfers not to advertise stuff (you know like car dealers stickers on the back of your brand new car) but Smug Mug is different to me and I am certain other mugs feel this way aswell... I will use it with pride! Can not wait for someone to ask me about it! When I created this thread, I was hoping that it would stay with the "I got my camera strap" theme. Then, as DavidTO mentioned, we need some pictures to show it off. It looks like it turned into a "where is my strap?" thread. Sorry SmugMug for having another thread to inquire about the strap. :uhoh Uh... sorry. I take it there's another thread I shoulda used? I'll make up for it with the bestest strap picture ever when I get mine! Thank you! Got mine today. Decided to to go back to my hippy roots for awhile; makes a great headband (quite hot though) ... then its on to the camera. 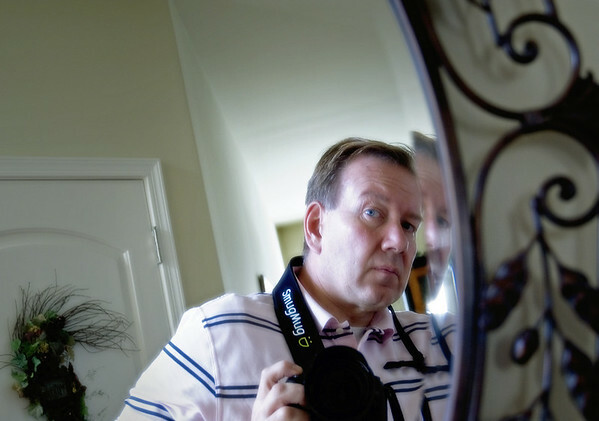 Here's me in a round mirror snapshot ala wholenewlight's idea. Either way is fine, but email is a bit easier for me. Just make sure you include your address! I spent a lot of time over the weekend looking up addresses. Baldy: Hey Sheaf, check out these cool straps. If anyone wants one can you send them one? Hang in there Sheaf, you are doing an awesome job! Very good quallity strap did not expect that....my old canon strap has been replaced! 40D, 20D, 17-55 2.8 IS, 100 2.8, 70-200L 2.8 IS, 300L 2.8 IS, Plus a ton of strobist gear and studio lights. it's here... it's cool... it's mine! thank you SMug & dgrin! pm's from dgrin will get you your straps, mine was a pm request. when i saw the email post, i wrote, asked if we needed to do both... nope, either works, don't do both. Hopefully my strap comes soon so I can be a cool kid like the rest of ya! Here's mine with my new laptop! Thanks Sheaf! I didn't want to send another needless email to confuse you all. Camera: "I'm a canon EOS! Baby!" Camera: "I like this thing its comfy and Brenton dosn't complian about his sore neck"
The mailman delivered my strap today. Thank you SmugMug!! The strap is great, definately replacing the canon stock strap.